THEY HELP US IN SO MANY WAYS. CONSIDER OUR SPONSORS FIRST, BEFORE SHOPPING ELSEWHERE. 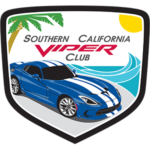 The Southern California Viper Club is the largest and most active regions in the Viper Owners Association. With year-round great weather and hundreds of enthusiastic members, our club maintains a huge variety of events to appear to its affluent membership. We offer everything from scenic cruises to private tours of top-notch facilities to high-performance driving at various tracks throughout our SoCal region. In order to maintain the high quality of our events, we depend on our Club memberships and Sponsors to help fund the events. It is a win-win situation for all who sponsor/participate and helps perpetuate the excitement, friendships, and association with one of the greatest American Muscle cars ever built. This is a powerful way to help promote your business. Our Club is made up of many business owners and affluent business people. What better way to help our Club and network within our own Club by supporting each other. The Southern California Viper Club has one of the best and most friendly websites around. Our webpage view statistics continue to grow and we are fast approaching an average of 1,000 views per day. All our club correspondence revolves around the website and will continue to be the central hub for communication. People from all over the world visit our site and follow our events and activities. Sponsors will be given a username/password and are encouraged to get involved in our forums by interacting with our Club Members through forum posts. Any “Specials” or new products may also be posted for sale. Want to host an event at your facility? We will help promote and coordinate our Club attendance at your event. Want to be recognized at one of our VOA SoCal Club Events? Sign up as a gold sponsor. Intersted in Becoming a Sponsor? 300×300 px sized advertisement on our website “SPONSORS” page. Everything in “Member’s Business Directory”. Given your own promotional web page on our site. Everything in “Bronze Club Sponsor”. Forum and event promotional privileges.